Hazel is my second child. She came after a very difficult and traumatic c-section where the hospital literally put my life in danger. My first round with birth was the first time I ever understood the feeling of wondering if I would live and being scared for someone I cared about so deeply, my child. I remember vividly, after I saw that positive pregnancy test with Hazel, first feeling absolute joy. A child, a second child! Oh I had planned for and wanted this child. But then came the fear. The nights of crying and weeping and facing the experience I had before. What if I didn’t survive this time? What would happen to my family? I wanted to undo it. I wasn’t ready. And yet there was the test, positive, I had to become ready because this was happening. Hazel’s birth was one of the best experiences of my life. It was quite healing. In the planning stage, after reading Ina May Gaskin’s book Birth Matters, I decided I was going to have a homebirth. I would go to the hospital if there was an emergency, but I would not give them the chance to create one like they did last time. You can read more about why I chose a homebirth on my blog. I found an incredible midwife. I found an incredible doula. My husband and I took a VBAC class and I spent every evening talking with and meditating with my sweet baby while she was still inside of me. By the time I went into labor,I was not only ready, but excited to birth this baby. It’s a good thing no one told me she was going to be 10lbs before she was born! My mom had come to help me with the baby. Yet, a week and a half after the delivery date, there were still no signs of labor. The day I went into labor, I woke up in the morning feeling that Hazel would never decide to come. I sent my mom across the city because the one thing she wanted to do while visiting me in Seattle other than care for me and meet the baby was visit her temple and it was her last day. I sent my husband to work. I sent my daughter to a friends. A morning just to myself, I wasn’t sure what I would do with it. And then, out of nowhere, as soon as I was by myself, contractions started. I hadn’t had any cramping or lost my mucus plug or anything. I was supposed to have an appointment with my midwife at 11. At 10 I texted her and said I wasn’t sure if I could drive. Contractions were coming fast! They went from non existent to 5 minutes apart in less than an hour. I had planned on having time once signs of early labor began to do the finishing touches of getting the house ready. Needless to say, labor came on too strongly for me to think about doing anything in the house. I called a friend to help me until my doula and midwife could arrive. My doula arrived around 11, she called my midwife and said, “hurry!” and called my husband and said “get home from work now!” Things were progressing. I was managing labor well, with breathing and focusing, but I was really surprised how quickly everything came on. By 11:30 I was in the birth tub which felt so nice. Water during birth is everything. Around noon, I felt like I had to poop. My doula told me to wait until the midwife arrived because she was worried I was ready to have the baby. I didn’t think I was that far along, and really had to poop. Turns out I was right. After that, things slowed down. I’m not sure if my baby turned or not, she was posterior most of pregnancy and could be coaxed into a better position for a few hours, but usually popped right back. When things slowed down, we felt her positioning and she was definitely posterior. And back labor started. I was really worried when labor stalled because the first time this happened at the hospital, I was told I had to have pitocin and I never progressed another cm after that. This time my midwife sent me for a walk with my husband. Then she did a few things to help baby reposition. Then I took a nap. After that Hazel was still posterior. My midwife and I talked, and we decided to continue with our plan to stay at home since her and I were still doing well. She broke my waters and things got really intense really fast. As soon as she broke my waters, I went into transition. I had 3 big contractions that were completely overwhelming. Zac held my hands through them and helped me moan through them. 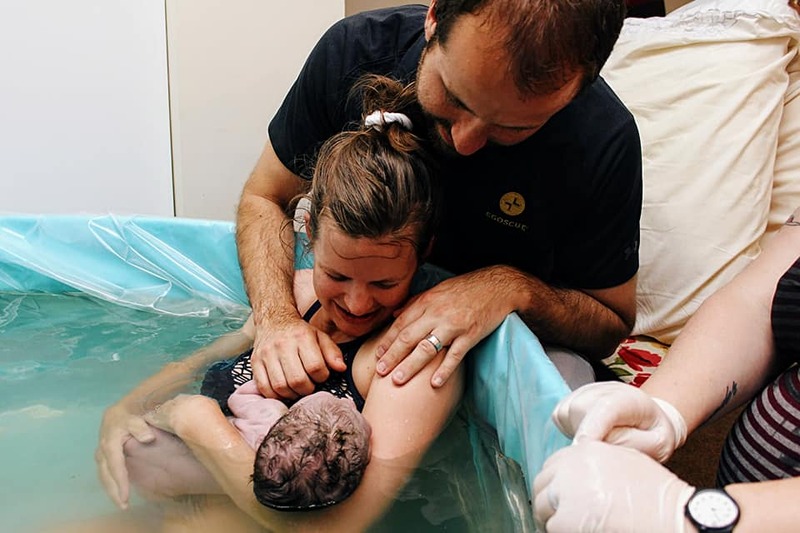 My doula looked really happy when this happened and I knew just by looking at the excitement on her face that this was supposed to happen and that I was alright. After those 3 contractions I was pushing. And pushing was not bad at all. I felt when I was pushing that the contraction itself guided me. If I pushed just right then the pressure from my push pretty much counteracted the pain of the contraction. Ed Sheeran was playing quietly in the background. I was vaguely aware of my midwife listening to mine and Hazel’s heartbeat, but mainly I was so far in labor land I was totally focused on what I was doing. My husband said this part took forever and was so boring. Haha. He sat behind me and put a cool rag on my head between contractions. Everyone else just waited. I pushed for about an hour. It was hard work, but not painful, not even when she crowned. She came out sideways with her hand above her head and was 10 pounds 2 ounces. My midwife told me that when she reached down to support Hazel as she was emerging, Hazel grabbed onto her finger. Next thing I knew she was all the way out and in my arms. My midwife directed her body straight into my arms and told me to pat her back. Hazel took her first breath in my arms. She cried for just a moment and then looked up at me with those amazing eyes saying “I’m here now mom.” We just sat here for what was probably just a few minutes but felt like an eternity. After a few minutes, I moved back into the bed to deliver the placenta and have a stitch put in for a minor tear. All this time I held Hazel and let her nurse. I was in heaven. Every ounce of energy in every cell of my body seemed to have been used as I birthed her, but I felt incredible. I laid in bed snuggling, eating and resting until everything was cleaned up and it was time to sleep. In the morning, my mom brought big sister by and made an enormous and wonderful breakfast. It was the perfect birth experience. This birth experience taught me that I can overcome. It taught me that I can trust my body. It taught me that listening to my inner guidance is paramount to having positive experiences. Of course I need educated and capable people around me, and I value their input, but the person that knows most about me and my baby is in fact, myself.